USPS letter carriers capture a signature for every Certified Mail letter delivered – regardless if your purchase the Certified Mail Electronic Signature or not. Your Certified Mail letter will provide evidence of mailing, in-route letter tracking and final proof of delivery. The option to purchase the signature after delivery from USPS is no longer an option. Make sure to add the signature with the Certified Mail Label at the time of purchase if you are needing it. Certified Mail Envelopes provides a 7 year archive of your mailing data including in-route tracking scans from USPS, proof of delivery confirmation and optional Extra Services such as Return Receipt Electronic Signature service. 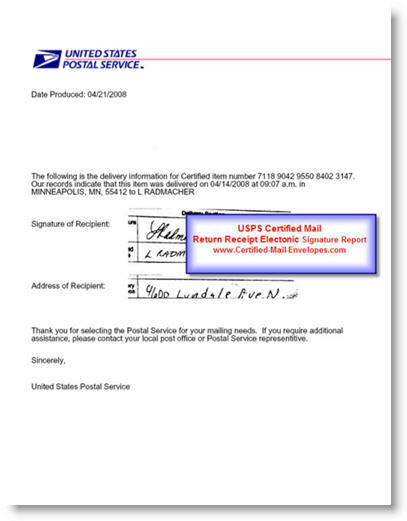 USPS Certified Mail Signature Confirmation is made available in a PDF file from the U.S. 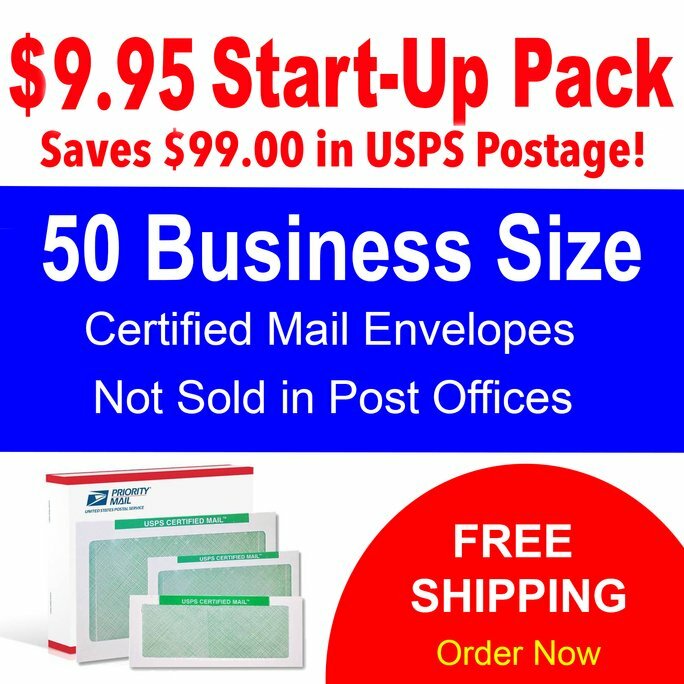 Postal Service and may be purchased either before you mail your USPS Certified letter. A copy of the Return Receipt Requested Signature is collected even if you do not pay for the Signature at the time of mailing. The signature is collected and digitally stored by USPS as a part of the United States Postal Service Certified Mail Extra Services Delivery Confirmation system in San Mateo, California. USPS Special Services provides similar services for Express and Priority Mail. Each Certified Mail Return Receipt Requested Signature is created in PDF file format from USPS and printed on United States Postal Service stationary. The Signature displays either a signature or stamp from the receiving company including the date and time your USPS Certified Mail was delivered. USPS sells this Signature Confirmation service in PDF file format. The signature is collected by the letter carrier at the time of letter delivery. The image is either the recipient’s actual signature or a stamp used to mark the letter delivered. USPS charges $1.40 for the Signature service if you purchase the service in advance of the mailing. You can no longer purchase the Signature service ‘After Mailing’ through the USPS. The USPS proof of delivery is summarized in the Electronic Return Receipt – ERR that displays the actual Certified Mail article number, date, time, deliver post office and delivery address information. Should you need a PDF of the Signature, you must purchase it prior to your mailing with your label. Certified Mail Envelopes supports options for Proof of Mailing, Electronic Return Receipt delivery confirmation and the Signature Confirmation service from USPS in PDF file extracts delivered to your secure data warehouse, in our website, bulk download, or secure FTP delivery signature extract files for download.